Conservative radio host Laura Ingraham just absolutely destroyed Charles Krauthammer on the 14th amendment and anchor babies tonight on Special Report. Laura Ingraham: There’s quite a debate about whether the 14th Amendment has to be repealed. I know a lot of people glibly say… That’s not actually been settled and you could do a whole hour on the jurisprudence surrounding that. Krauhammer: It’s been around for 150 years. 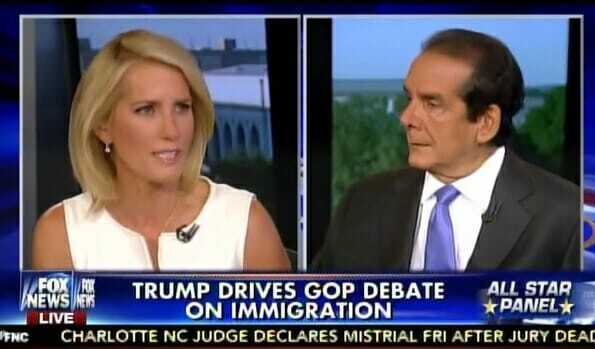 Ingraham: Well, we actually didn’t have a problem with illegal immigration in the 1800s as we know. That wasn’t an issue. It was directed at the slaves who did deserve to stay here. So, it really was an important clause and the author of the clause Howard Jacob said it didn’t apply to foreigners in the United States. But, you know, this is a long conversation… And I know Trump’s rise annoys a lot of people now. And I get it. But the people in this town who have been propping up two parties that have failed the Middle Class, failed them on these global trade deals… that have absolutely not delivered what they promised to deliver to the Middle Class, failed them on enforcing the border, failed them on all these ideas that America was going to export its values around the world… They’re ready to throw in with the guy who has all these conflicting positions maybe because the guys who said they were going to be consistent weren’t. And they’re not fighting for the people. Ingraham: And Bush and Obama didn’t stop it. Neither stopped it. Neither did McConnell or Boehner when they had the chance. They’re not stopping it. People are tired of it. Never has Charles Krauthammer sounded more like a Wshington elitist than he did tonight.